Much of the functionality many hoped would make an appearance in Windows Phone 7 when it launched has for a long time been promised by Microsoft to be coming in a future update. 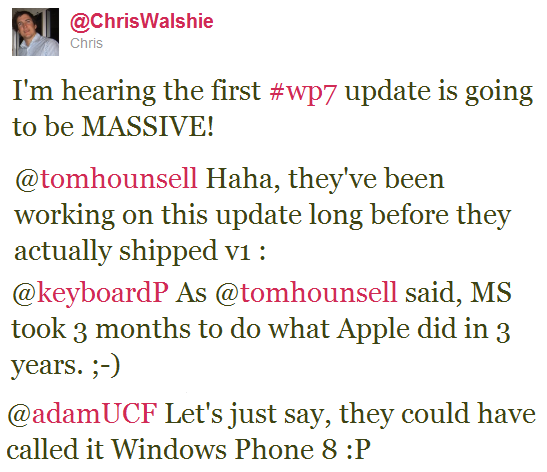 Now, it appears that a WP7 developer has slated the release of a major update for January. Windows Phone 7 developer Chris Walsh has confirmed via his Twitter account that the next major update will be ‘massive’, saying, “Let’s just say they could have called it Windows Phone 8”. This obviously means the update will bring a number of new features, many of which we already knew about. Some of the features expected to make an appearance in the update include copy & paste, third-party multitasking functionality, voice enabled Bing navigation, and custom ringtone support. However, there will most likely be much more, as we don’t think a WP7 dev would be this excited about something as basic as copy/paste. There’s obviously no way to confirm the January release date as of yet. However, Chris promises to release screenshots soon. We will of course keep you posted as more details become available.